Supplied: In a five litre container of peat free compost, healthy and well established, approximately 100-120cm (4 feet) high, with full planting and aftercare instructions. This exotic looking hibiscus has good sized rose pink blooms with large, velvety-red splashes at the petal base and a spire of creamy stamens at its heart. The flowers are freely born for some weeks in late summer. The leaves are large, broad and toothy, coloured light green. 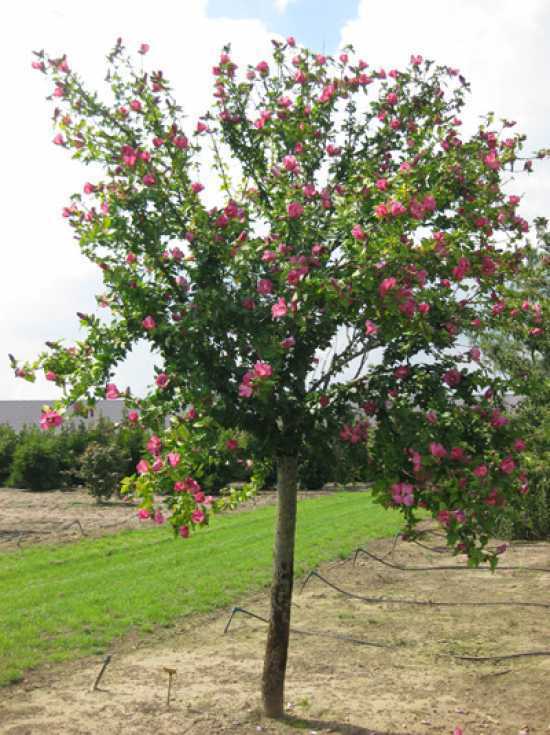 This makes an imposing large shrub or small tree given time which relishes a warm, sunny spot, enjoying some moisture. They are very late into leaf each spring, and it is worth waiting for the elusive foliage to unfurl.